Most of the classic Universal Studios unforgettable fiends from the 1930s and ‘40s were played, at different times, by multiple actors. Dracula, Frankenstein’s Monster, the Mummy, the Invisible Man; all of these characters were played by different actors at different times. However, Lon Chaney Jr. (who at times played all these characters with the exception of the Invisible Man) alone played Larry Talbot, aka The Wolf Man. The son of, arguably, the most famous silent movie star (perhaps Charlie Chaplin was more famous), Chaney Jr. left an indelible mark upon the Golden Age of horror, and even in the 21st Century his performances can provide more than a few chills. For an actor who was soon to become a horror icon, it is interesting that the role that shot him to stardom was not in a horror film. It was, rather, in the 1939 Oscar nominated adaptation of John Steinbeck’s Of Mice and Men, that Chaney became a star. His portrayal of the gentle but mentally impaired giant Lennie Small showed Hollywood that the 33 year old actor had some wonderful acting skills, and his performance is fondly remembered (and also humorously parodied in many Warner Brothers cartoon shorts). The role of Lennie not only gave Chaney his first taste of stardom, but it also placed him where he needed to be in order to secure his most famous character. To many of his contemporaries, Chaney was very well liked. Paul Malvern, a producer at Universal, commented “There never was a nicer guy. He got along with everyone.”3 Evelyn Ankers (who appeared no less than eight times with Chaney, and with whom she had somewhat difficult relationship)4 said “When he wasn’t drinking, he was the sweetest.” Chaney was known as a heavy drinker, once telling a director that he had to get everything from his performances before 1 PM; he couldn’t guarantee anything after that. Charles Barton, director of Abbott and Costello Meet Frankenstein, claimed “He had the problem all through his life, even when he was very young.” 5 His drinking and his predilection for practical joking earned him many negative feelings, however. While filming Son of Dracula, Chaney broke a vase over the head of Robert Siodmak, claiming it was a “prank.” He also ended up having his dressing room at Universal reassigned to Evelyn Ankers after he and Broderick Crawford destroyed it by drunken behavior and fighting. At a studio event, he once almost got into a fight with Ankers’ husband Richard Denning. Nevertheless, actress Ilona Massey said of Chaney “I think Lon Chaney is one of the nicest, sweetest people in the world.”6 Despite his difficulties, this man who was almost universally admired was a staple of horror cinema in the 1940s and beyond. Not only did Chaney exclusively play the Wolf Man, he also tackled other horror roles. 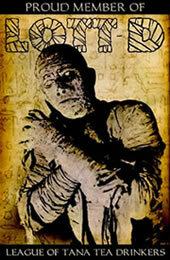 He played the character of Kharis the Mummy in three films (1942’s The Mummy's Tomb, 1944’s The Mummy's Ghost, and 1944’s The Mummy's Curse), and he donned the neck-bolts of Frankenstein’s Monster in 1942’s The Ghost of Frankenstein. He also played the blood sucking Transylvanian Count Dracula in 1943’s Son of Dracula. He holds the honor of playing all of Universal’s classic characters, a distinction that neither Béla Lugosi, nor Boris Karloff, nor can John Carradine claim. It seemed that during the 1940s Chaney was playing as many different and unusual characters as his celebrated father. Due to the typecasting he suffered and his alcoholism, Chaney’s career flagged in the 1950s. He appeared in several low budget horror films, while becoming a regular for producer Stanley Kramer (in such films as 1952’s High Noon and 1958’s The Defiant Ones). Kramer praised Chaney’s skills, saying that he would call upon Chaney when presented with roles that were too difficult for most actors.7 He also costarred in a brief 1957 TV series, Hawkeye and the Last of the Mohicans, playing the character of Chingachgook. 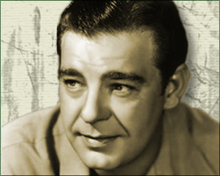 Lon Chaney Jr. is indeed one of the true Masters of the horror film. He was always a beloved person by his contemporaries and his fans. Anthony Eisley, an actor who appeared with him very late in his career, commented “He was a wonderful, lovely, unbelievably interesting man.” Late in his life, Chaney stated “They don’t know how to make good horror films in Hollywood anymore…. Boy, they really need me!” 10 While horror films have gone on without him, his legacy endures to the present day. He is so much of a genre legend that in 1997 he was one of four actors (along with his father, Karloff, and Lugosi) to be honored in the “Classic Movie Monsters” series of postage stamps.11 Over 60 years after audiences first heard the poem beginning “Even a man who is pure in heart…,” Lon Chaney, Jr. can still bring a tear to our eyes and a chill to our bones.